Hyon Yong Chol is the immediate past Minister of the People’s Armed Forces, the DPRK’s equivalent to a minister of defense. 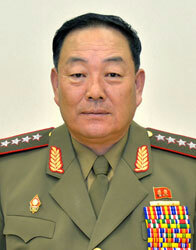 From July 2012 to May 2013 he served as the Chief of the Korean People’s Army [KPA] General Staff. Hyon is also an alternate (candidate) member of the Korean Workers’ Party [KWP] Political Bureau and a member of the Party Central Committee. Hyon has served in the KPA’s ground forces and has been a battalion commander and brigade commander. He has also worked as a chief of staff at an infantry training center, chief of the Reconnaissance Bureau and was commander of the VIII Army Corps from 2006 to 2010. He also held the position of Vice Chief of the KPA General Staff. Hyon Yong Chol’s political career began with his first election as deputy (delegate) to the 12th Supreme People’s Assembly in 2009. Hyon was promoted from Lieutenant General (chungjang) to four-star General (taejang) prior to the 3rd Party Conference on 28 September 2010. His name appeared on the promotions list with Kim Jong Un and a number of KJU’s key supporters including his aunt and current Party Department Director Kim Kyong Hui, Choe Ryong Hae (who was appointed director of the KPA General Political Department in 2012) and Kim Kyong Ok (who is one of the KWP Organization Guidance Department’s deputy directors with a military portfolio). During the 3rd Party Conference Hyon was elected a member of the Party Central Committee. On 15 July 2012 VMar Ri Yong Ho, chief of the KPA General Staff, was “relieved” of his positions during a meeting of the KWP Political Bureau. On July 2012 Hyon was promoted to Vice Marshal, which may have established him as Ri’s de facto replacement as chief of the KPA General Staff. At a loyalty rally held on 18 July 2012, VMar Hyon was identified as Chief of the KPA General Staff, however he was later returned to his former rank of four-star general. Gen. Hyon has attended numerous military inspections with Kim Jong Un, and serves as one of KJU’s closest military advisors. On 31 March 2013 Gen. Hyon was elected an alternate member of the KWP Political Bureau. 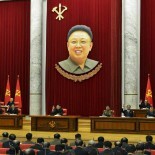 He was a rostrum member at the 7th session of the 12th Supreme People’s Assembly on 1 April 2013. In May 2013, Gen. Hyon was removed from office as Chief of the General Staff in May 2013 after serving for approximately ten months. He eventually resurfaced as commander of the V Army Corps and holding the rank of Colonel General. In June 2014 Hyon Yong Chol was appointed Minister of the People’s Armed Forces and was made a member of the DPRK National Defense Commission. In May 2015, Hyon was removed from office. There are various accounts about his dismissal, including that he was one of the KPA’s commanders executed by anti-aircraft artillery [AAA] and that the reason for his dismissal was because he fell asleep at a national meeting. According to DPRK state media, Hyon Yong Chol was born in January 1949 in North Hamgyo’ng Province and joined the military in March 1966.